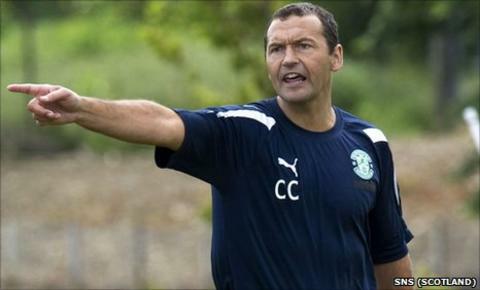 Nottingham Forest are back in talks as they seek to recruit Hibs manager Colin Calderwood as assistant boss, BBC Scotland has learned. On Tuesday, it emerged Birmingham City had sought permission to speak to the 46-year-old. Now Forest, who were linked with a move for their former boss Calderwood a fortnight ago, have resumed talks with the Scottish club. Calderwood has been in charge at Hibernian for nine months. Hibs finished last season in 10th place in the Scottish Premier League, 11 points off the bottom. Former Northampton boss Calderwood managed Forest for two-and-a-half years between 2006 and 2008. Calderwood has previously refused to rule out a return to England, with Birmingham and Forest keen to secure his services. Both Championship sides want him to be their assistant to new managers - Forest have Steve McLaren in charge while Chris Hughton is at St Andrew's. "I can't sit here and say categorically there's nothing that would excite me elsewhere," said Calderwood in a press conference last Friday. "If there is any truth in the stories, I'm in a wonderful position and I should be thankful for that. But my job at the minute is to be here." Calderwood, whose playing career included stints at Swindon Town and Tottenham Hotspur, led Forest out of League One during his spell in charge before being sacked in 2008.